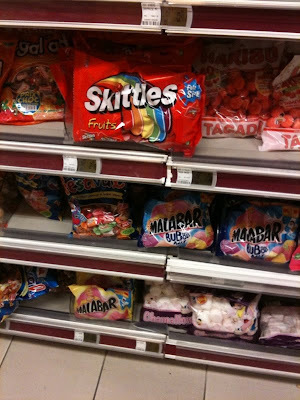 Spotted at Monoprix... Skittles! Maybe it's just me, but this is a new arrival, right? One large bag of snack packs is selling for 2.48€. Time to taste the rainbow! We've had Skittles at the ED in Aix for at least a year, maybe 2. Still can't find Reese's PB cups consistently, though. Occasionally Casino has them, along with Dr. Pepper. Has anyone seen Mr Pig?